TokyoFlash seems to have a knack for making crazy, confusing, and amazing time pieces. These are not the type of watches for the average Joe who merely wants to peer at their wrist and be able to tell the time at a glance. These are wearable pieces of art, that will only tell you the time if your brain can figure out how to read them. 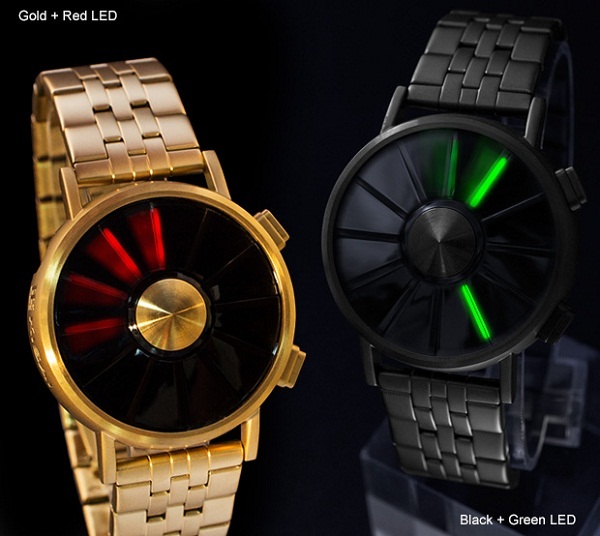 The newest watch on the block is called the Kisai Blade LED Watch. The lens pulls inspiration from aviation and automotive turbine engines, and the LEDs underneath it can appear to rotate like a propeller to show you the time. There are two different ways to display the time. The first is turning mode, in which a blade of light will spin around the face of the clock, landing on three locations which indicate the time. The flashing mode will show the hours and minutes at a glance. As always, it’s not as easy as it sounds. The fully lit blade of light will indicate the hour, the flashing blade will indicate the five minute section, and four LED dots will indicate the exact minute. This will cost you over $140, and you can see the different color and wrist strap options below.